It’s the morning of the 15th of January and I am calling you from our roadside lodge here at 2,600m (8,530ft) above sea level. We are on the road leading to Chile and most importantly for us near the entrance to the Mendoza Provincial Park of Aconcagua. Yes, today we are going to start on the mountain! Acclimatization at this more moderate altitude has gone well so far. We are relaxed and we feel we are organized. Yesterday we had a beautiful day. 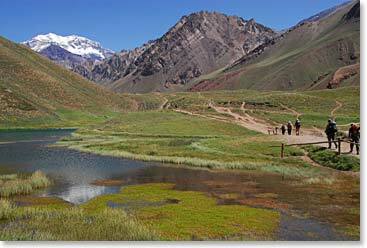 We drove just a couple of kilometers up the road from our hotel and there it was: Aconcagua! It was a totally blue sky above with the mountain rising far, far above us, and it still looked a long ways away. We continued up the road and drove to the Chilean border and we all go out of the car to walk around at an elevation of 3,900m (12,795ft). It won’t be until tomorrow that we reach that elevation again. The day after tomorrow we will go up to Plaza de Mulas and sleep at an even higher elevation. So we are working our way up bit by bit. 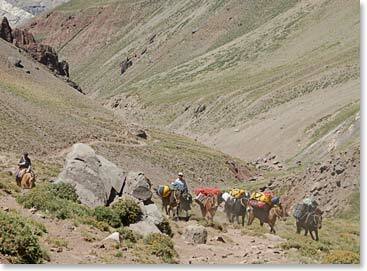 You may be interested to know that yesterday we got a good taste of what the weather can be like here on Aconcagua. It started with perfect blue skies with quite a violent thunderstorm in the afternoon and heavy rain. Typical mountain weather! We were in the hotel when that came but I believe the next time that will happen we will be on the mountain. And we will be ready for it! 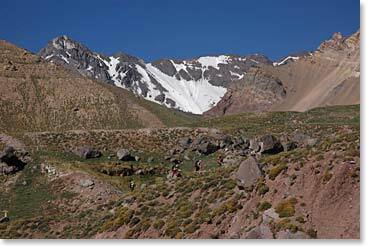 We will keep you posted as we continue our trek now, beginning up the mountain towards Plaza de Mulas base camp and on to the higher elevations on Aconcagua. 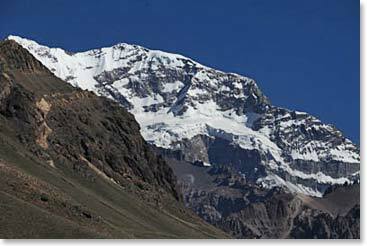 Wally called in around 3:30 pm on Aconcagua to report that the whole group had made it to their first camp, Confluencia at 3,400 m (11,154ft). When they arrived there was still some sun overhead but there were some clouds building. When Wally called the team was relaxing at camp and enjoying some nice hot tea and refreshing juice! Our first view of Aconcagua is a welcoming site. 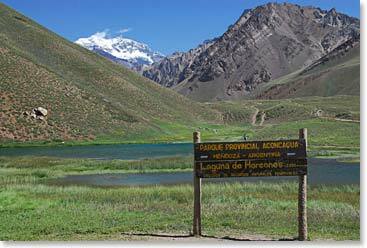 We were thrilled to see the sign for the Mendoza Provincial Park of Aconcagua, the gateway to our adventure! Our hike begins with beautiful blue skies above us.